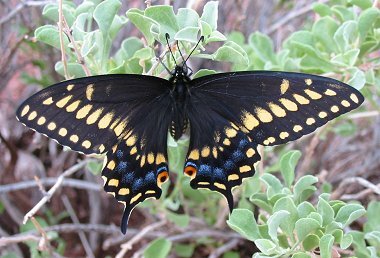 The Black Swallowtail has a black body with yellow spots along each side. The wings are black, and grow to 4" across, with two bands of yellow markings running down laterally. On the lower wings, the female has a distinctive blue band of coloration between the two yellow bands, with a red spot near the tails, the male has less blue with more distinctive red spots. The Black Swallowtail is found all throughout North America, and north into southern Canada. Like all butterflies, the Black Swallowtail begins it's life as a caterpillar. When mature, the caterpillar is 2" long and white to leaf-green with black bands on each segment broken by yellow or red-orange spots. The caterpillars prefer the leaves of plants in the parsley family including Queen Anne's Lace, carrot, celery and dill. Sometimes plants in the citrus family are also eaten. The iridescent blue band gives the butterfly in the photo away as a female. As a butterfly, the species prefers open areas including fields, suburbs, marshes, deserts, and roadsides. Adults feed on nectar from flowers including red clover, milkweed, and thistles. Males perch and patrol for receptive females. Females lay eggs singly on leaves and flowers of the host plant, which are then eaten by hatching larvae.